As the heatwave continues, so does the need for easy, cool and casual clothing! On hot days, it really is about cool and comfy dressing, with some fun accessories of course! 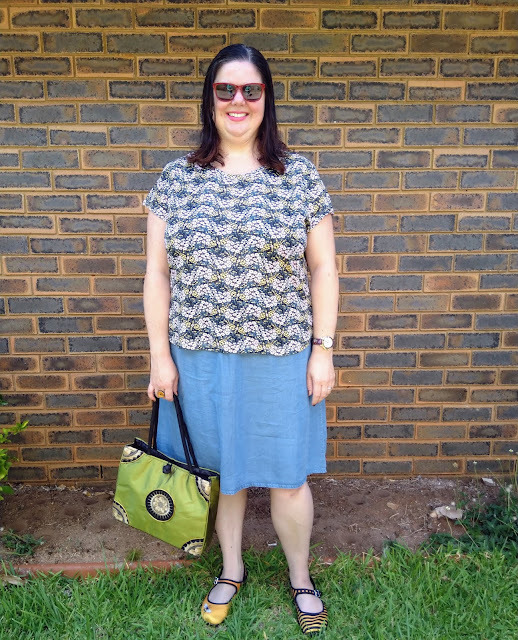 This chambray skirt is a recent purchase and has been a frequently worn garment in the last few weeks! It's such a light fabric and is so comfy to wear. It is so versatile and makes getting ready in the morning so easy, as I only have to grab a printed top and go! Perfect for when the heat is so bad and your ability to make decisions is impaired! Ha! Orange is such a fun and vibrant colour and has become one of my favourite colours to wear in the last few years. It's such a happy colour and it is a great colour to wear in summer! Orange looks great paired with lots of different colours, but orange and blue would have to be one of my all-time favourite colour combinations. 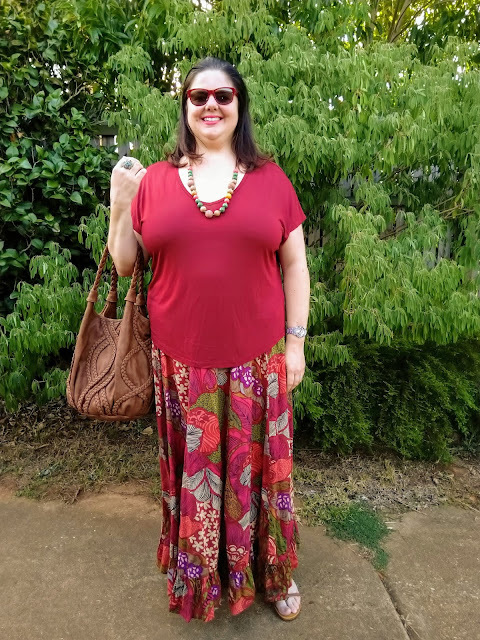 I've had this skirt for many, many years and it is such a bright and fun print. This top is quite new and is very orange in real life, even though it looks more red in the photos. 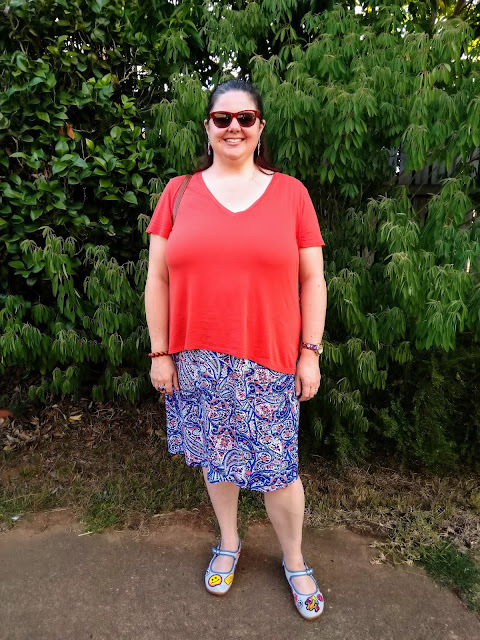 I completed the outfit with a mix of orange and blue accessories. Speaking of accessories, my bag is a recent purchase from a day out op-shopping! It still had all of its original tags on and was in pristine condition! It's original price tag showed $49.95 and I got it for $10! Such a great find! There's not really a single colour that I don't like or wouldn't wear! 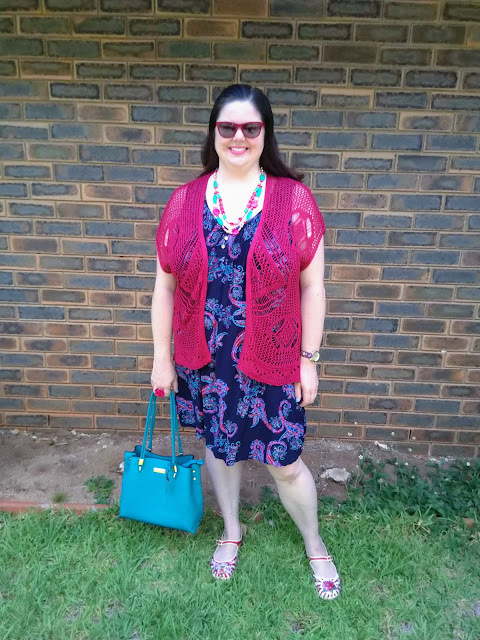 Since I started blogging in 2017, my love of colour has grown and my appreciation of wearing different colour combinations has broadened, as I am continually inspired by other bloggers. Blogging has really encouraged me to have more fun with fashion and to discover my own style. I love playing around with different patterns and colours and making them my own. I could never imagine just wearing something because it is on trend, if it didn't feel like me. As much as I love trying new colour combinations, it is also fun wearing my all-time favourite colours. I just love all shades of pink, purple, blue and green, so when I saw this dress the other day on sale, I knew it was coming home with me! In the same store, I spied the beautiful beaded necklace below and knew they would be a perfect match! You know I'm a sucker for colourful beads! Haha!